1/4 c rice wine vineagar. Minced garlic and ginger separately. Clean and chiffonade brussel sprouts or cut into quarters and slice as thinly as possible. Dice tofu into 1/4 inch cubes. In a large sautee pan, dry toast carraway seeds. Toast until fragrant. Add oil and butter to carraway seeds. . When foam subsides add garlic and stir fry until it just begins to brown. Add brussel sprouts and contuinue to stir fry for two minutes. Add soy sauce and ginger. Coat sporuts with soy mixture and allow to come to simmer for 5 minutes. When sauce is reduced by half, add tofu and stir to coat with spout soy mixture. Allow to cook till almost dry. Serve and garnish with the dried basil. I took the two heads of puntarella I got at the Embarcadero Farmer’s Market yesterday and made them two ways. 1) I julienned one of them after discarding the woody core. Added to this a rough chopped white onion. Reduced 1 cup of balsalmic vinegar by half. Add 1 tsp dry mustard, 2 cloves of garlic minced and 1.5 c of olive oil. Poured the warm vinegrette over the puntarella mix and let it sit. 2) Meanwhile, I julinenned the other head, also discarding the hard woody core. Minced 2 cloves of garlic. Heated 3 tbsp of oil in a sautee pan. Added the garlic and then the puntarella. Seasoned with s&p. Stirred frequently and removed when I began to see that the puntarella was coloring. Pretty damn good. The sauteed puntarella was t be honest a little bland so I added some freshly grated pecorino which really complimented the bitter flavor. The slad was good too. The sweetness of the balsalmic reduction vinegrette really took the sweetness of the onion and cointerbalanced the bitter puntarella with out totally masking its flavor. Saturday night dinner. Results of my Farmer’s Market booty. Time for some zen chopping. That’s when I buy a lot of food and chop it all up and use the reptive motion of the chopping as a form of meditation. Tonight’s zen ingredients are via the Farmers Market at th Ferry Building. 1) One pound of black chanterelles. 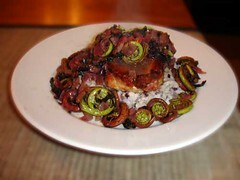 2) One pound of fiddleheads. 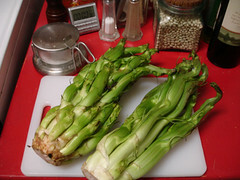 4) Two bunches of puntarelle. I’m really interested in the puntarelle. I’ve never seen it before, which just automatically made me buy it just to see what its like. Tune in later to find out what I did. Evil plans shall now commence.